As I draft this post from a swanky little Starbucks outlet in Tokyo, I admit I have been a ardent fan of the coffee chain since I could afford it, which was only after I landed my first real job after college. Coffee here isn't cheap, but what you get is great service, decent ambience, short queues, great location and most importantly peaceful reading and working atmosphere. Originally from Seattle Washington, Starbucks now has close to 19,000 stores across 62 countries.They have a formidable presence here in Tokyo as well. The first time I visited Tokyo, I was shocked to see the sheer number of outlets here. There are at least 4 outlets right around my workplace in Roppongi, and each of them almost always swarming with people. And Starbucks recently opened its 1000th store in Japan; Staggering numbers for a tea drinking country where Coffee is a somewhat a recent addiction. One question that almost always crosses my mind each time I head to a Starbucks store is, How much does a cup of coffee really cost? And how much premium am I paying. So here are some numbers. 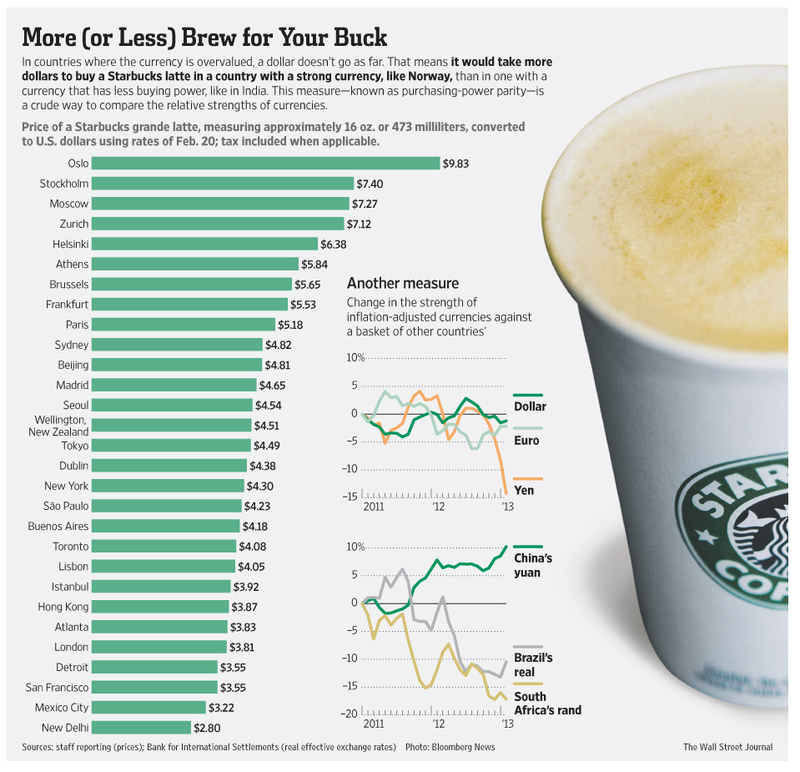 The Wall Street Journal (WSJ), like their famous Mac Index, also has a Starbucks grande latte index (below) which compares Starbucks prices across countries. The same cup which costs $3.5 USD in San Francisco (say our reference cup), costs as high as $9.83 in Norway, and as low as $2.8 in India. Obviously, these prices are list prices with taxes and not adjusted for PPP. The Tokyo price is similar to NY. There are some markets where the prices are counter intuitive. 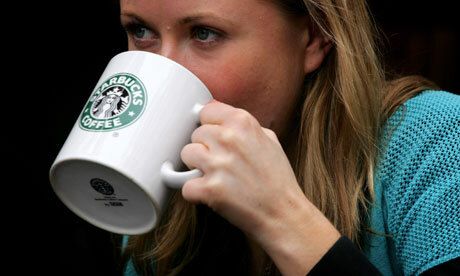 For instance in China with GDP per capita 1/5th of the US, it costs a staggering 35% more for the same cup. Like India, where the labour cost is a lot cheaper, shouldn't it be priced a lot less in China too? 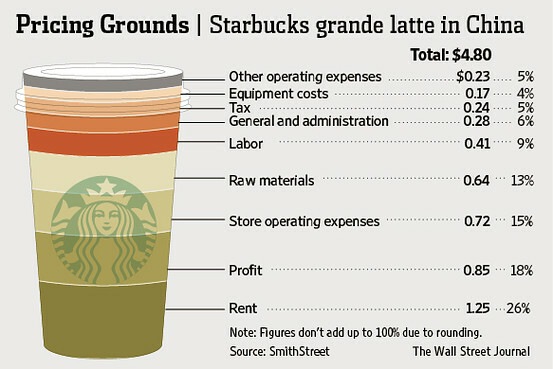 So how much does a cup of coffee really cost Starbucks? It's hard to get the exact data but let's look at their financial statement for some clues. I have worked out some rough numbers here in my spreadsheet. The answer really depends on which country and store location you are looking at. If you look at the breakdown of their operating expense, the major cost drivers are Cost of Goods, i.e coffee beans, milk etc, Occupancy and Store operating expense i.e store rental, maintenance, utilities, store staff cost etc. In addition there are smaller components around equipment depreciation, shared administrative expenses etc. Let's look at Cost of Goods first. Coffee is procured internationally, processed and stored mostly in plants and warehouses in the US. They are then distributed to their 19000 stores. This distribution cost is expected to be higher in locations further from trading ports, and countries with higher import duties and levies. Other ingredients such as Milk, Cream, cheese etc can be procured locally to keep the costs down. Occupancy and Store Operating expenses are probably the biggest cost drivers. Stores in prime locations obviously would cost higher than stores in suburbs. Employee salaries generally would also vary by location. Interestingly, Starbucks generally has a single menu price in a country before a Sales tax that could vary depending on the state. Which means, cheaper locations are actually subsiding the stores in the prime locations, however you could argue they could have much lower sales than stores in prominent locations. The last piece depends on their store mix. The financial statement reveals an interesting model that Starbucks actively pursues - Store Licensing. Roughly half the stores are run by licensees. And this is especially high in Asia, where 77% of all stores are Licensed outlets. In Japan, Starbucks hardly owns any of the 1000 stores. In these licensed outlets, Starbucks charges a licensing fee for the store to use their brand. As part of the arrangements, it receives royalties and license fees and sells coffee, tea and related products for resale in licensed locations. Without incurring any of the larger operating expenses, they get access and mindshare in prominent real estate. So coming back to our initial question, how much does a cup of coffee really cost? Looking at the numbers, Starbucks on an average makes roughly 18-22% pre-tax margin on each cup of coffee sold in Americas and Asia. In EMEA, they are just breaking even. You pay mostly for the right to sip a decent coffee in a convenient location with a good in-store experience. And it makes no rational sense at all to get a Coffee to-go, if you aren't going to sit in and enjoy your cup of coffee. WSJ also recently had a breakdown for a Grande Latte in China and cited the high price to the cost of operating large and spacious outlets and high import tariffs, while maintaing an 18% profit margin. So the next time you visit your favorite Starbucks outlet, you now know what you are paying for. By the way, It took me 3 hours to research and draft this, while tapping into their free wifi. I think I had my money's worth. Krugman wrote an interesting piece recently in NY times, titled "Hitting China's Wall", and later on his blog, called " China’s Ponzi Bicycle Is Running Into A Brick Wall". Nobel prize winning, Keynesian economist, Krugman has quite a reputation among economists, for his liberal political views. In the article he explains, China's growth has finally hit the wall. For three decades, it's been fueled by surplus 'infinite' labour and high investments. The existence of this surplus labor, has two effects. First, for a while such countries can invest heavily in new factories, construction, and so on without running into diminishing returns, because they can keep drawing in new labor from the countryside. Second, competition from this reserve army of surplus labor keeps wages low even as the economy grows richer. Low wages in turn result in low Private consumption. Private consumption accounts for only about 36 percent of China’s GDP. That’s about half of what it is in the United States. It’s almost two-thirds of what it is in Europe. The reason Krugman states, is that surplus labour kept income low for years, and income generated from rapid industrialization was being bottled up by enterprises and government for re-investments. He compares this low-consumption high-investment economy to a Ponzi scheme. Chinese businesses were investing furiously, not to build capacity to serve consumers, who weren’t buying much, but to serve buyers of investment goods — in effect, investing to take advantage of future investment, adding even more capacity. However things are changing. China's running out of surplus labour and wages are rising. Though good for the the labour force, Investments are increasingly running into sharply diminishing returns which means private consumption needs to rise sharply to rebalance the growth. And Krugman thinks consumption can't keep up the pace, signs of which is being witnessed in their slowing growth rate. In short run, investment projects are necessary before consumption catches up. In response, the government announced an additional 1 trillion yuan infrastructure stimulus package last year. In addition, easier private lendings from state-owned banks and the recent lifting of lending rate controls, should help stabilize the economy. However, it's quite clear as the economy goes through a restructure, even China realizes, it can't keep growing at the pace we are so used to. Chinese Finance Minister Lou Jiwei recently said the nation won’t use “large-scale fiscal stimulus” measures this year, signalling that the government will tolerate a slowdown in the economy. He further added, China will promote growth and boost employment while fine-tuning policies and keeping the fiscal deficit unchanged, and will also avoid big adjustments to short-term macroeconomic policies. The government in March set a 2013 goal of 7.5 percent, the same target as in 2012. The world had hoped China's consumption would help fill the void left by US and EU. But the signs aren' that encouraging. With no signs of global recovery and China's slow down, we have interesting times ahead of us.